I’m a breaded tenderloin snob. I know its history (the schnitzel German immigrants brought to America), and I know the good from the bad. The bad generally means a frozen fritter, one dripping in grease, or just bad meat. I consider myself an aficionado of the sliced, beaten, breaded, and fried pork sandwich. 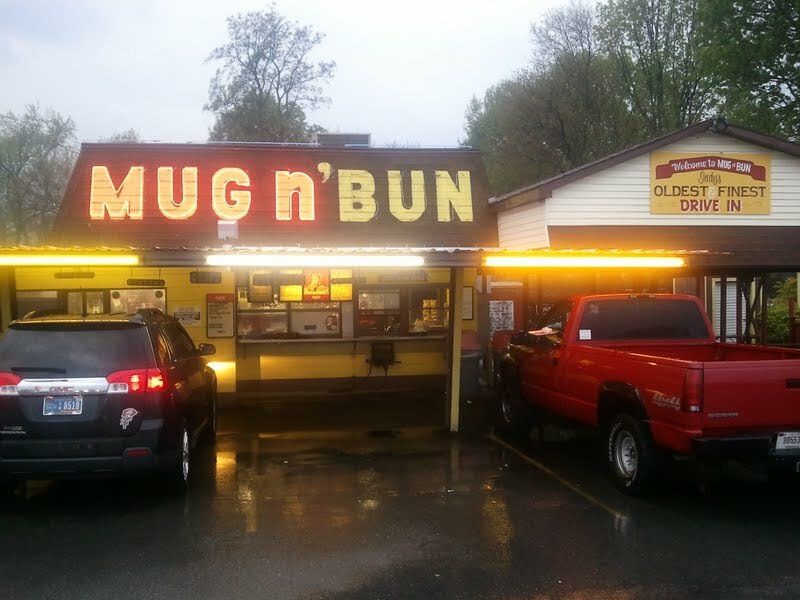 This pork hubris led me to start my “Indy Tenderloin Tour” during the month of May to introduce out-of-state Indy 500 fans to this local delicacy, the likes of which can only be found in Indiana. 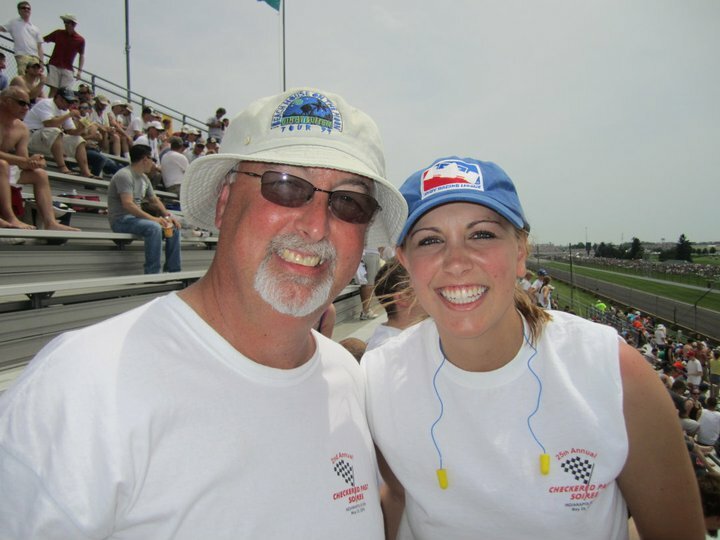 And then I went to Iowa Speedway. I was minding my own business. Oh, I noticed the pork chops and stopped to talk to the fine folks from the Tama County Pork Producers. 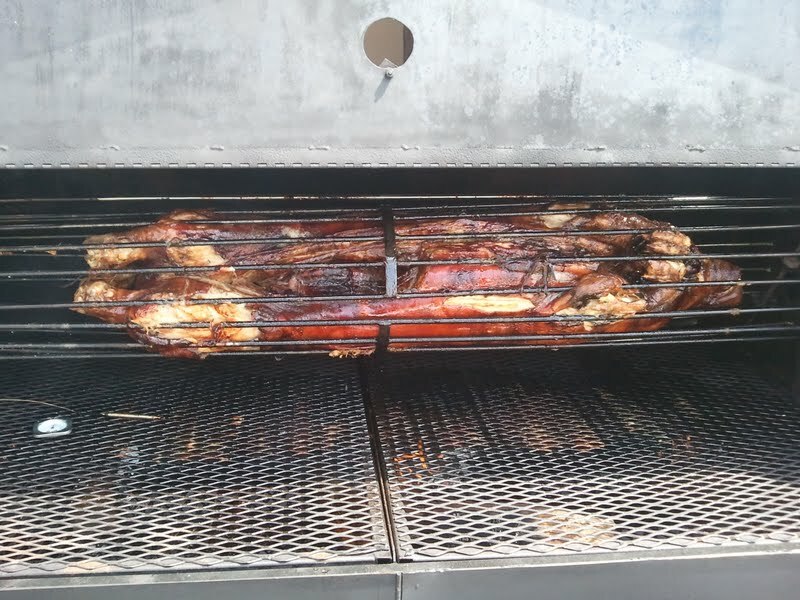 These were just the type of grilled pork offerings you would expect from Iowa residents. They were quite tasty. But of course, they weren’t breaded tenderloins. And then I walked past The Machine Shed, a local restaurant that operated one of the concession stands. It was very hard not to notice The Machine Shed, since this was cooking directly in front of it. 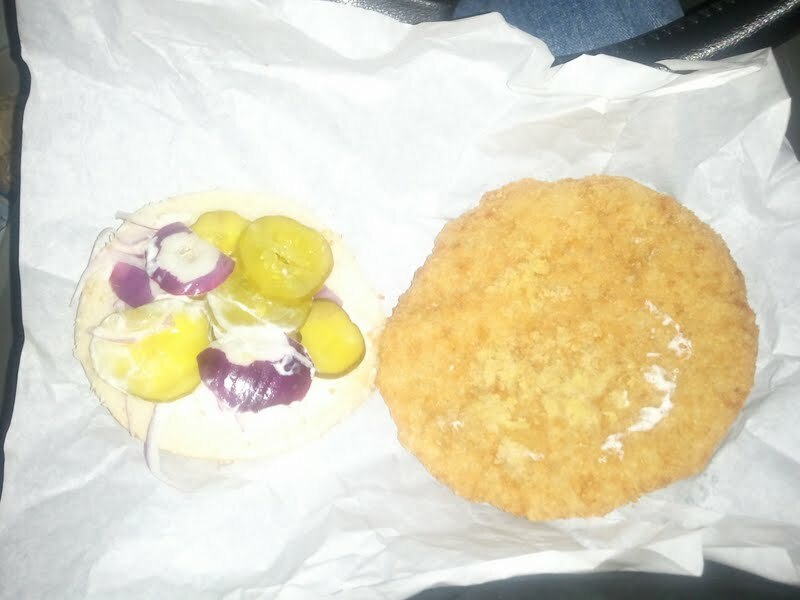 I believe I insulted the workers in The Machine Shed when I asked if the tenderloin was a frozen fritter. These tenderloins are sliced from the loin by The Machine Shed in their cutting room, pounded by real human beings, and breaded/battered in their own recipe. I was also pleased to learn that the pork is locally sourced. Iowans care about their food. All that’s nice, but what about the taste? Well, I included this sandwich in my “Indy Tenderloin Tour” didn’t I? Doesn’t that tell you something? My first bite told me that these Hawkeyes knew what they were doing. The meat was thick and cooked to perfection. Tenderloin fans know that you hide bad meat by pounding it thin and breading it heavily. This was a thick piece of meat with nary a bit of gristle. The coating was more of a batter than a breading and was crispy, bordering on crunchy. My personal preference is for breading instead of batter, but that does not change the fact that this was a great tenderloin. 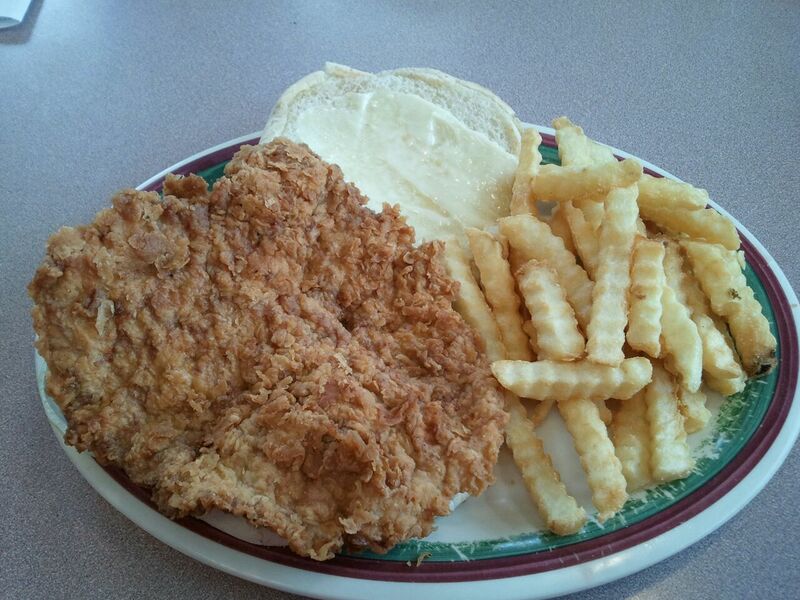 If you are in Iowa and are lusting after a breaded tenderloin, The Machine Shed is ready for you. In the previous stops on the Indy Tenderloin Tour, we have only visited Speedway once. This final edition takes us to an absolute “must see, must eat” stop. 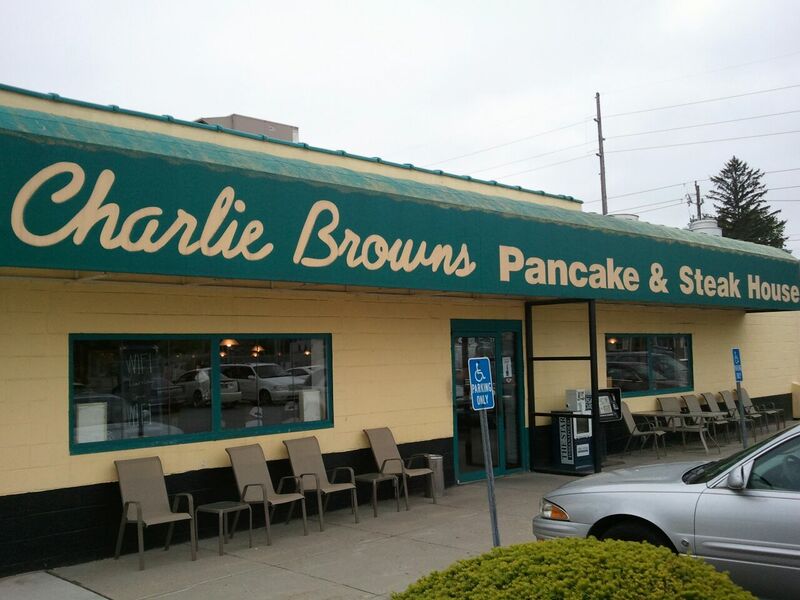 Within sight of the Indianapolis Motor Speedway and across the street from the Dallara facility, you will find Charlie Brown’s Pancake and Steak House at 1038 Main St. in Speedway, Indiana. If you are in Speedway and need to mainline a breaded tenderloin, this is the place. From the outside, Charlie Brown’s is nondescript. The awning is faded and in need of repair. 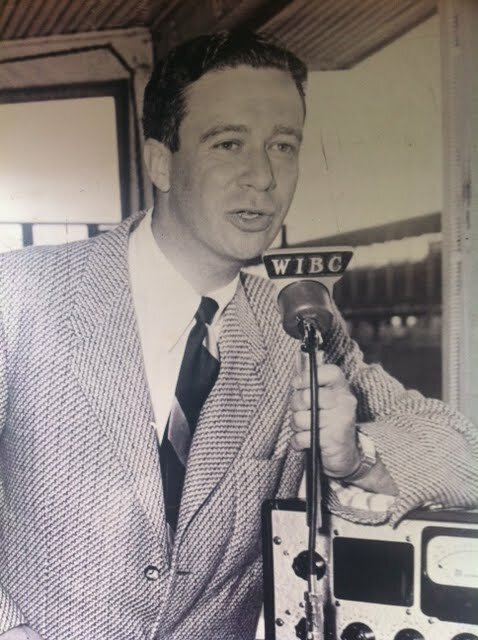 But when you walk in the door you are greeted with a life size photo of Sid Collins, for many years the voice of the 500. Once inside the door, the walls are a tour of Indy memories. 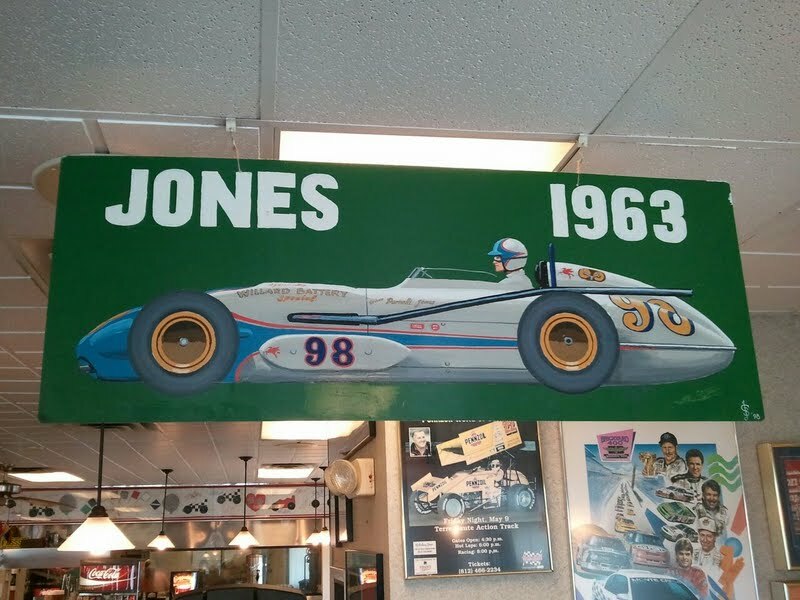 Any place that has a Parnelli Jones painted 98 picture hanging from the ceiling is aces in my book. Take your time and stroll around the joint. It’s OK. The management understands its patrons. Look in the display case. Check out the quilt over the waitress station. Look at the walls as you go to the lavatory. This place is an Indy fan Mecca. Seen enough yet. I don’t think so. Now it’s all about the tenderloin. 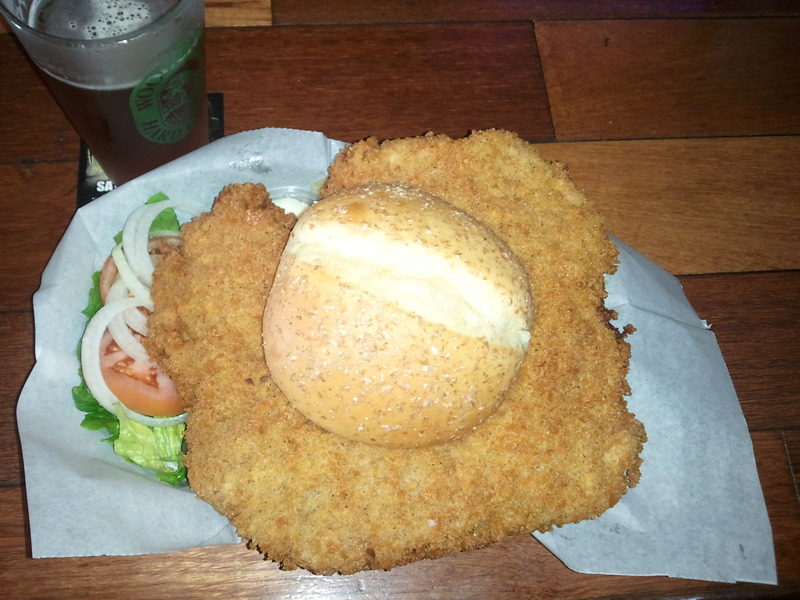 Make sure you CAREFULLY order the “Hand Breaded Pork Tenderloin.” Do NOT order the pork fritter. The fritter is frozen; the hand breaded tenderloin is not. Shannon, our overworked waitress on an incredibly busy Saturday, tells us she was just a part-timer…33 years ago. She knows her stuff. The tenderloins are pounded and breaded on site with a commercial breading that has a few added (secret) ingredients. My suggestion is to get the platter; it comes with fries and slaw. The slaw was delivered promptly and was tasty. Within minutes, our breaded beauties arrived. Looks great, huh? I loved the sandwich. Charlie Brown’s does it a little differently. In other posts, I have commented on sandwiches that have a thick pork center. This one was pounded thin with a breading that stayed on the pork. No slippage. I dislike breading that slides off the meat. This was great meat pounded very thin. It’s a great counterpoint to some of our other stops. Stop here for the whole package: the platter for $7.15, the kitsch on the walls, and the meat between the bun. THIS is a Hoosier classic. Our rating? This is an absolute checkered flag! 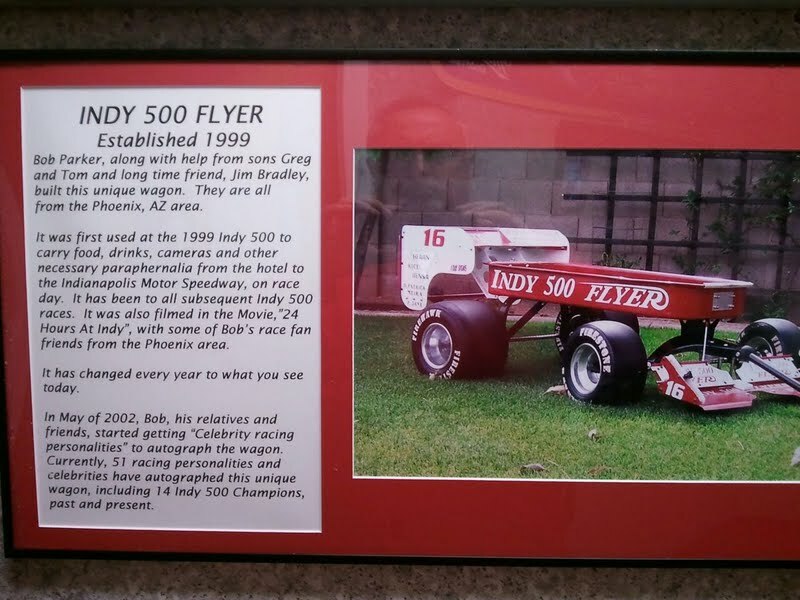 Do not miss this sandwich and this shrine to the Indianapolis Motor Speedway. I hope our little tour has been informative and entertaining. 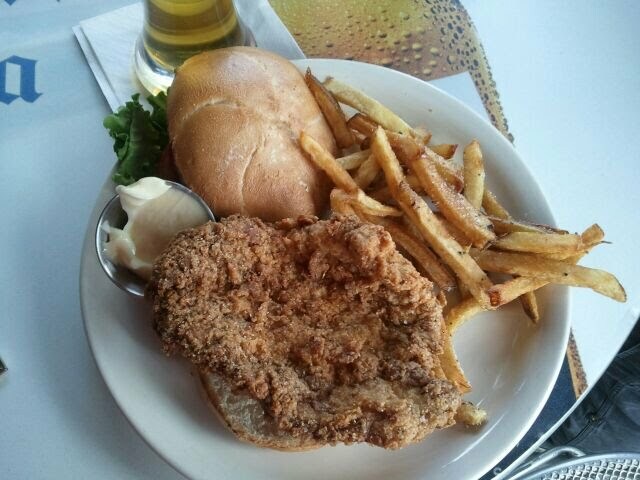 An Indiana breaded pork tenderloin is a great way to enhance your visit to the track. Bon appetit! I am an unabashed lover of kitsch. Tacky? I love it. Over-the-top odd? I’m there. That is why I absolutely love the Red Key Tavern at 5170 N. College Ave. in Indy. It suits me. The term “eclectic”  comes to mind when you walk in the door. It is a neighborhood tavern in every sense of the word. The regulars all know each other. You can leave your money on the bar when you hit the head. The jukebox has Frank Sinatra, Benny Goodman, and Bing Crosby on it. How cool is that? How about that tenderloin? Our friendly bartender Robin told us the meat is pounded and breaded on site. The breading is nothing fancy. It’s just a commercial product. But that’s OK. The magic is in how this baby is cooked. Most places deep fry their breaded tenderloins, but the Redkey has no deep fryer. What they have is a 60-year-old flat-top grill. The breading is light because they cook your breaded beauty on this grill with just a splash of oil. And pause for a moment to consider the flavor that a flat-top grill has burned into it over 60 years. That’s called seasoning. Get the picture? This is a great sandwich because of how it’s cooked. 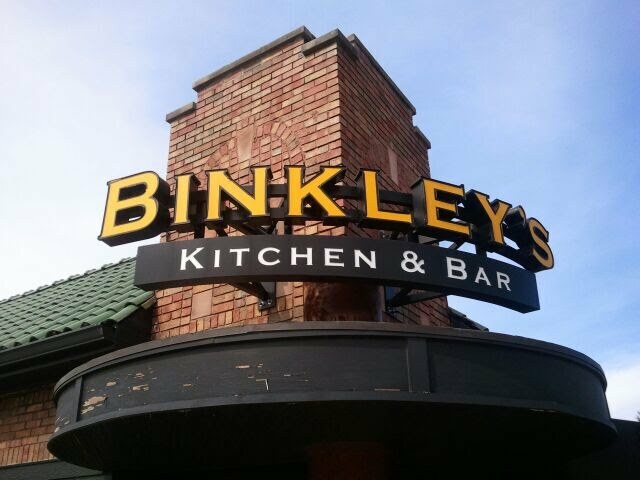 Add a couple of locally brewed Sun King Cream Ales and you have a great meal. Get there early if you want a tenderloin. They run out. Order the potato salad. Again, they run out. If the tenderloins are gone (you have been warned), then get a hamburger. They are cooked on the same seasoned grill. They have no beer on tap. They do, however, carry locally brewed products. I suggest the Sun King Cream Ale or the Sun King Wee Mac. Play the jukebox. Try something you have never heard before. Behave yourself. Follow the rules. Enjoy this place. Bars like this are vanishing pieces of Americana. 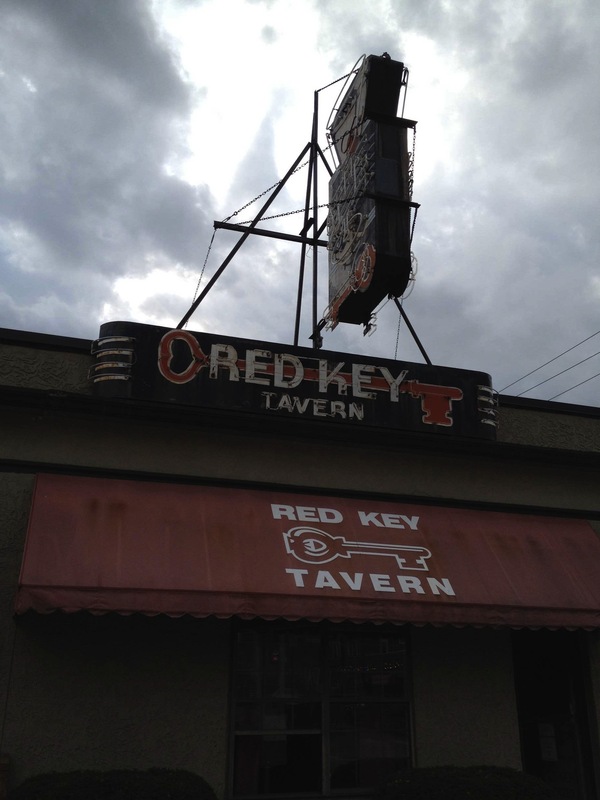 I have to give the Red Key Tavern a checkered flag, not only for the tenderloin, but for the whole experience. 2. For the vocabulary impaired, “eclectic” is defined by the New Oxford American Dictionary as “deriving ideas, style, or taste from a broad and diverse range of sources: her musical tastes are eclectic.” And yes, I am a supercilious prick for using the term “eclectic” and for assuming that the reader does not know the definition. Even in the rain, that looks GOOD. And the rings, fries and root beer were good. Which brings us to the tenderloin. Our lovely and rain-soaked car hop Heather told me that the breaded tenderloins were really…fritters. It is acceptable to gasp. The meaty mecca of Robin Miller fame serves frozen fritters. All of you pork pros out there know that a truly good breaded tenderloin is hand-pounded and hand-breaded, never frozen. I was so saddened that I needed another root beer. This is not to say that the visit was disappointing. 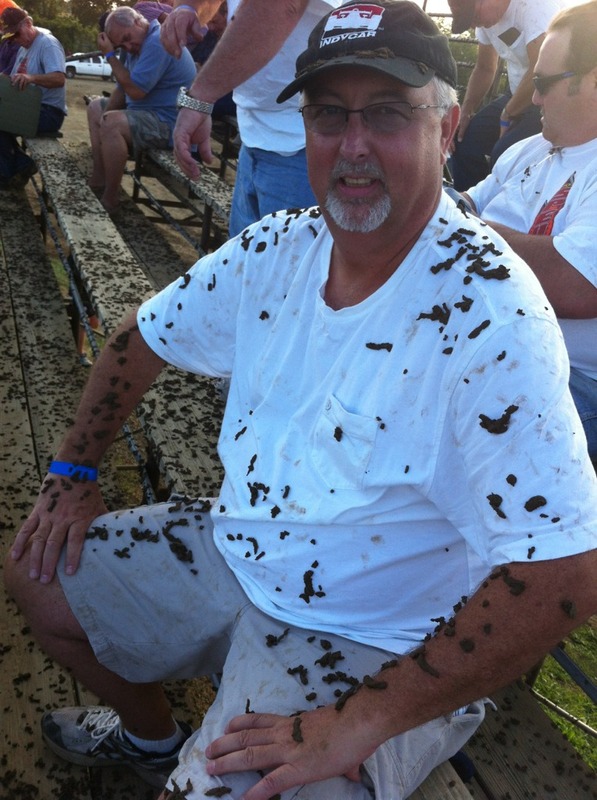 The ambiance of a Speedway landmark combined with curb service and home-made root beer almost negated the fritter…but not quite. This is, after all, the Indy Tenderloin Tour. My advice: go. If the frozen fritter leaves you cold, order a foot-long coney. 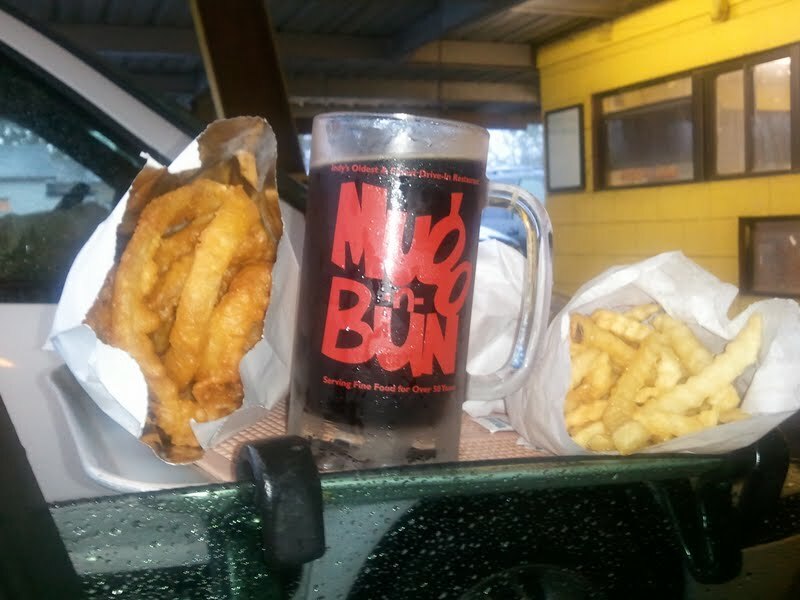 Be sure to order your root beer in the mug to drink there, and when you leave order a root beer to go in the large plastic souvenir cup. If you don’t like the in-car experience, you can always sit at a picnic table. 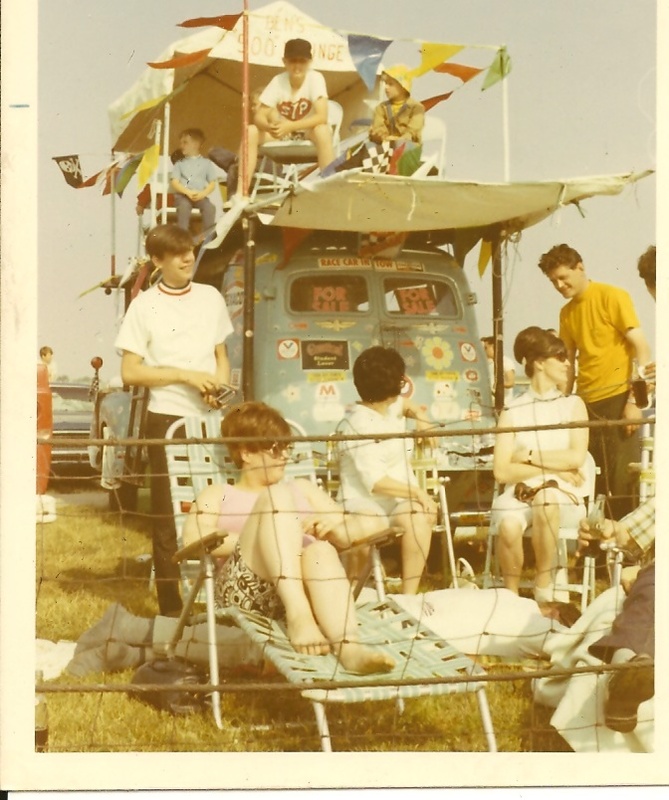 It’s a drive-in. Just have fun. My rating: A Checkered Flag for the ambiance and root beer and Green Flag/Yellow Flag for the fritter. Any food tour needs to include things iconic in nature. 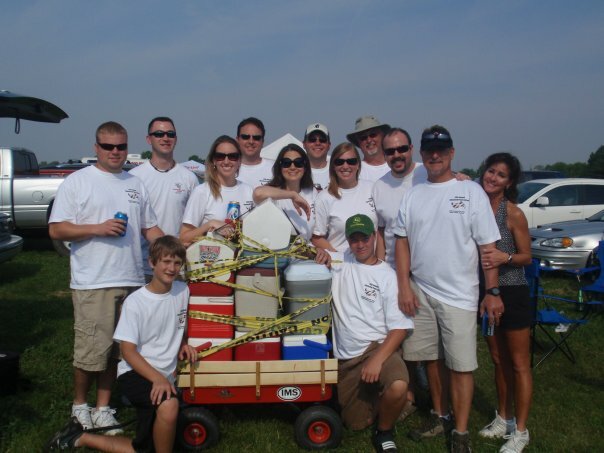 Other than the Indy 500, what else is synonymous with Indiana? You got it – high school basketball. And what basketball movie is most connected with Indiana? No, it’s not Blue Chips. What’s wrong with you? It’s Hoosiers. Filmed on location in Indiana, the fictional Hickory Huskers were inspired by the small school Milan Indians of 1954 . The player who took the last shot to beat Muncie Central that day was Hoosier hero Bobby Plump. Bobby, who still advocates a return to a single-class basketball tournament in Indiana, is the owner of Plump’s Last Shot in Broad Ripple, an Indy neighborhood near Butler University. And a bar with that kind of pedigree MUST serve a breaded tenderloin sandwich. 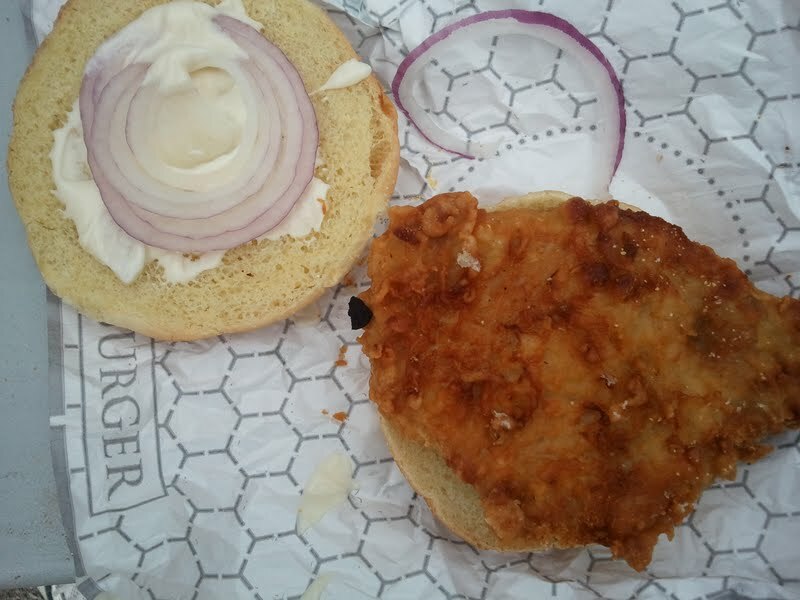 They call it The Hoosier Tenderloin. We rolled in on a Sunday at noon. Plump’s radiates…something. And that’s not a knock. It has a hippie/hiker/neighborhood vibe. The location is an old house adjacent to the Monon Trail  and off the main drag. It’s dog friendly with a great outdoor seating area. Our friendly bartender Robin offered up menus and beer specials. We ordered two breaded beauties and watched ESPN while we waited. Look good, huh? The sandwiches were HOT. As we decided our plan of attack, we heard a serious pounding coming from the kitchen. My son and I exchanged knowing glances. It was Fred, the cook, pounding out pork loin for the sandwiches of the people who had just ordered. I believe that’s called “fresh.” Zach chose to cut his tenderloin in half and double it. I sliced the overhang off and dipped it in mayo until the sandwich was small enough to hold. It was great. When Fred emerged from the kitchen, he told us that Plump’s cuts, trims, and pounds its tenderloins daily. Nothing frozen here. It’s coated in buttermilk and dredged through panko bread crumbs, flour, and spices. The panko gave it a really crisp texture that held up for the half-hour it took to eat it. With pickles, onions, and mayo, it was an absolute game winner. My rating: it’s a checkered flag. 1. Here’s the link to the gym that was the home of the Hickory Huskers in the movie. It’s in Knightstown, Indiana, just a short hop on US 40 or I-70 east of Indy. When I was in high school, we would occasionally sneak in and play ball on a weekend. The gym was no longer used for competition. We would crawl through the window of the old Wilkinson High School gym to do the same thing. Good times.